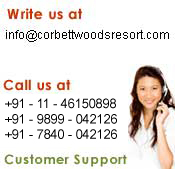 Corbett Woods Resort is cheap & the best luxury hotels in jim corbett national park and luxury corbett resorts portraying for its customers, luxurious camping and eminent hospitality. Classifiable architecture, design and the natural greenery around the location makes it remarkable and distinguishable among all other Wildlife Resort near or around Delhi. Offering its customers a Luxury Wildlife camp and a memorable Jungle Safari and corbett cheap packages, it is considered as a Luxury resort in jim corbett national park. Located on Ramnagar - Jhira road, it is just 4 kms in reach of Jhirna Gate and nearer to banks of river Dhela. Lucky resident guests also get a chance to admire nature in all its glory from the resort premises. They see elephants, deer and various species of birds frequently visiting banks of Dhela which is hard to find in other Corbett hotels. Hectic day-today life has a hold on all of us; by taking weekend breaks around Delhi, you get a chance to rejuvenate. There is immense variety of Wildlife Packages in India offered to the customers but Jim Corbett National Park is the most distinguished Tiger reserve in India and also the most opted for weekend destination near Delhi. Do not lose this great opportunity to steal some memorable moments with your special ones—both friends and family. Your vast search for cheap packages for Corbett which includes Wild life camp ends up at this resort which has 12 deluxe cottage tents and 4 premium cottages, well-furnished, spacious, air-conditioned units with ultra modern equipments, multi-cuisine restaurant, swimming pool, health club, conference facility and indoor/ outdoor games for the guests provided with excellence. It will prove to be a haven full of interesting things to do even after a long and tiring day out in the jungle with the animals. Children’s play area is a special feature of the resort to keep you and your children engaged. Budget hotels in Corbett lack these add-on features and other Corbett packages fail tremendously in providing such excellent services at such affordable prices. Our objective is to serve our guests with excellence, provide that perfect ambience, and great hospitality services with our professionally trained staff for your valuable stay at our resort.All you have to do is pack your bags and come over to this Resort; we will make your trip memorable in more ways than one.